2013 is about to end and that means two things: for peppermint (much like pumpkin in October) to be put on everything—Peppermint protein shakes? Why not?—and for publications across the nation and globe to reflect on their year. For us, 2013 has not just been a year where bicycling, pedestrian accessibility, urban renewal and design, and complete streets have all become fashionable and buzzworthy terms, but a year that has given us, as an advocacy and news publication, a re-birth. Many assume we take on a wide array of topics (which is true) that vary in connection (which is not true). In reality, we have a simple mission: to report and foster healthy, accessible living in the urban atmosphere. It’s as simple as that. And this year proved that Long Beach and its denizens are amongst the most avid supporters of such an endeavor: from battling rail Goliaths to women leading the way in bicycling advocacy, here are the top stories about all things good about Long Beach, from Longbeachize and beyond. We aren’t ones to toot our own horn more than we are to cherish something we’re proud of. And we’re proud of Longbeachize not just because we did indeed re-launch it, but the fact that it embodies the spirit of Long Beach so well: at first a collaboration between Streetsblog LA editor Damien Newton and writer Brian Addison, the hope was to launch a Long Beach-version of Streetsblog. But as with all things Long Beach, the endeavor turned out best when we moved from without to within, opting to reinvigorate the well-known Longbeachize by pairing with urban design guru Brian Ulaszewski of City Fabrick and Longbeachize founder Baktaash Sorkhabi. Moving beyond Longbeachize‘s previous biking/ped only approach, we now cover urban development, green issues, transit, and as we mentioned before, all things for good urban living. “It is very hard for me intellectually to accept that you value the life of a kid on this side of the city border more than you do a kid in my city.” These are the words of Mayor Bob Foster when addressing the Port of Los Angeles Board of Harbor Commissioners before they unanimously supported to push forward with the controversial SCIG rail yard project. Despite overwhelming evidence that the rail yard—to be built right next to West Long Beach neighborhoods—will adversely affect the already-marginalized populations that live near the project’s proposed property, project leader BNSF claims otherwise. And though the ultimate goal, at least for Long Beach, is to avoid the project interfering with the health of its citizens, there is something empowering about knowing that our mayor, City Council, the Port of Long Beach, and a plethora of other groups gave one of the country’s largest rail company a shiny middle finger. Sean Warner isn’t just a well-liked guy—he’s actually quite loved by Long Beach as a whole. The urban living community then rejoiced at his most recent appointment: Placemaker for the Downtown Long Beach Associates. The move by the DLBA to hire Warner shows two major things: 1) The massive organization which oversees downtown in a way that few can knows its local talent; and 2) The massive organization is understanding that the future of urban living lies not in creating more parking spaces, but creating more stopping places; places where people hang out, where people eat, where people live–not just drive through. This is not just a job for Warner but a shift in organizational philosophy. Long Beach Transit scored a massive grant to move forward with procuring a fleet of electric buses–and the Board, minus the loud dissent of boardmembers Lori Ann Farrell and Maricela De Rivera, gave the contract to a newly formed North American subsidy of Chinese motor company BYD. To say that there have been some struggles along the way is putting it lightly: from federal testing issues to fudging numbers to allegations of labor violations from the State, this drama is unfolding to become as a tale not just for those in Long Beach, but transit-goers across the nation. When bicycling advocate (and former fashion PR consultant) Melissa Balmer gave up her car, the thought of biking never initially crossed her mind. For many women, questions of style and comfort ran through her mind: Do I have to wear Lycra? How do I find a stylish helmet? What if I don’t want a sport bike? Can I still walk to work if I feel like it? 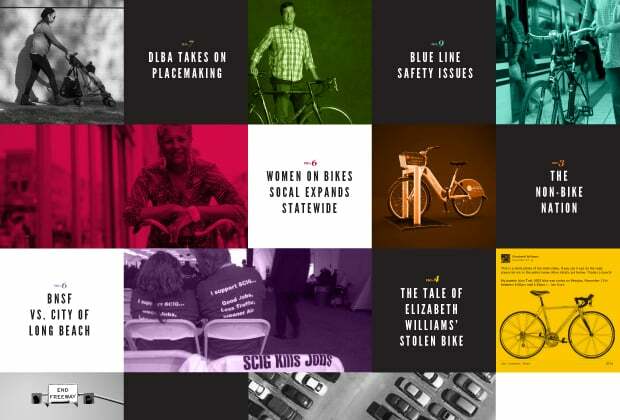 Soon enough, Balmer paired with Bikeable Communities to launch Women on Bikes SoCal—and in two short years, has expanded to become a statewide initiative called Women on Bikes California. The initiative attempts to connect “potential riders and passionate advocates alike through social media, blogs and (soon enough) with videos, Women on Bikes California hopes to encourage the next generation of cyclists to become inspired to discover how bikes can fit into their life.” Can we get an amen? Elizabeth Williams is the face of the idea that bicycling is for everyone—and by everyone, that includes women, people of color, people of affluence, people, people, people. So when the League of American Bicyclists Equity Council member had her bike stolen–in broad daylight with many people standing around—she not the only one heartbroken… The entire LA bicycling community rallied behind her. Through online sleuthing and a massive hand from the Long Beach Police Department, she scored her precious source of living back. And the story isn’t the all-too-common tale of a stolen bicycle but, more importantly, how bicycling connects those who don’t even know each other. If you don’t know April, you should. And if you do, you would know why she was not only asked to join the board of the Los Angeles Bicycle Coalition, but also why Bicycling Magazine named her one of the world’s 14 most innovative advocates for all things diplo-wheeled. April’s love for bicycling has merged with her love for Long Beach, her home–and that love can be tough. Critical and astute at both the things we have in Long Beach (protected bike lanes, for example) and the things we don’t (a way to encourage those who don’t bike to do so—another example), April embodies the larger vision of what bicycling can and will bring to a city’s culture and economy. Dare we say, “Bah humbug!”? It isn’t entirely an unwarranted response to Bike Nation’s supposed promise to bring bike sharing to Long Beach: following an announcement over 18 months ago that Long Beach would be home to one of the nation’s largest bike share programs, Long Beachers rejoiced loud and clear at Bike Nation’s massive $12M investment. And now, a year after they were supposed to install the first kiosk downtown, we’ve yet to see a single bike. Meanwhile, Anaheim–where Bike Nation had a handful of kiosks–has been dropped from the bike share company and they moved those kiosks to Fullerton. The implications of this project are not just big, but massive—and in a multitude of manners. The idea that all park space is created equal is an urban fallacy of major proportions, especially when one considers West Long Beach: its residents have a paltry acre per 1,000 residents. That’s about a soccer field. With overwhelming evidence that suggests accessibility to green space not just encourages physical activity but actually contributes to the overall health of a community (lower rates of respiratory disease, cardiovascular disease, on and on), this project is both beautiful and ethical in its development. The dilapidated and marginalized West Side, largely ignored on all levels from accessibility to green space, can now face the possibility of having 50% more park space. And that’s not just a “need” but an essential right in human living.